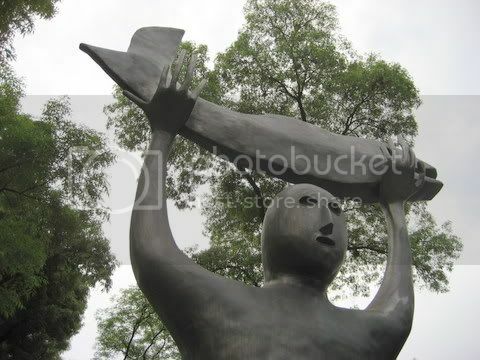 As part of Mexico City’s effort to provide access to art and Mexican history, a collection of bronze sculptures by famed surrealist artist and sculptor Leonora Carrington are currently on display in the boulevard on Paseo Reforma, between the Museum of Modern art and the Anthropology Museum. Carrington, born in England in 1917, left Europe during World War II, and relocated to Mexico City. She currently spends her time in Mexico and New York. Carrington is one of the premier modern surrealist artists and is considered an adopted member of the Mexican art family. Put on display in February, 2008, the sculptures on display are part of a collection made between 1994 and 2007. More than 15 pieces in total, the subject matter ranges from comical to the nightmarish, with a demonic oven thrown in for good measure.